American Express has two prepaid products that can be loaded at Walmart with pin-enabled gift cards. Called Bluebird and Serve, these products are loaded either by going to a register or at a kiosk known as the MoneyCenter Express. In this guide I will detail exactly which pin-enabled gift cards work at Walmart to load these cards and which ones do not work. For further reading, see: Beginner’s guide to buying & liquidating Visa & Mastercard gift cards & Best options for buying Visa and MasterCard gift cards. Metabank Visas come in a variety of different packages. The package shown above is sold at a number of popular retailers. To determines who issues a card, simply look at the fine print on the very bottom of the back of the package. MoneyCenter Express Kiosk – Works normally. Note: Cards purchased from Macerich Malls, Simon Malls and GiftCardMall are issued by Metabank and work as described above. U.S. Bank Visas come in a variety of packages. The one shown above is for a variable load card. You can determine the issuer by looking at the small print on the package. The pre-assigned pin comes in the package or call 866-952-5653 to set the pin. U.S. Bank issued Mastercards do work at Walmart, however they aren’t quite as easy as Visas. When loading Bluebird/Serve at the Walmart MoneyCenter Express kiosk these cards work just like normal. If you are trying to use them to load at a register, you must quickly hit the “Change Payment” button after swiping the card. If not, it will be processed as a credit transaction and fail. The “Change Payment” method is a bit tricky and is better described in this post. Register – Must quickly hit the “Change Payment” button. Looks very similar to Metabank packaging. Sunrise Bank Visas sometimes come in packages very similar to Metabank’s. Just like with Metabank cards, you can determine the issuer by looking at the fine print on the back. Some local banks and smaller credit unions issue their own Visa prepaid gift cards. As long as these cards are pin-enabled and not issued by a bank whose cards don’t work at Walmart (see below) they should work. Consult the documentation for those cards regarding how to set a pin and then load them either at the register or at the MoneyCenter Express kiosk. Visa cards issued by Incomm which include a wide variety of cards carrying the Vanilla branding, will not generally work at Walmart, but there may be a workaround. Many people have had success loading Bluebird/Serve with these cards in denominations of under $50, however this doesn’t seem to work for everyone. It is probably not a good idea to purchase these with the idea of liquidating in small amounts until you have tested this for yourself. Also, keep in mind that these cards do work to load REDbird in any amount, so that may be a better option. MoneyCenter Express Kiosk – May work in denominations of $49.99 or below. Register – May work in denominations of $49.99 or below. Any four digits that you choose on first use. Note: Cards purchased from GiftCards.com are issued by Incomm, but seem to work normally at Walmart. Many prepaid gift and rebate cards have the word “Debit” on them, but are not pin-enabled. If the card does not have a pin, then it cannot be used to load Bluebird or Serve at Walmart. Metabank, Sunrise Bank and U.S. Bank issued Visa gift cards all work to load Bluebird & Serve regularly at both the MoneyCenter Express kiosk and at registers. U.S. Bank issued Mastercards work normally at the MoneyCenter Express kiosks, but require you to quickly press the “Change Payment” button at the register. Visa gift cards issued by Incomm may work in denominations under $50. Pin-enabled Visa gift cards issued by smaller banks and credit unions generally work at Walmart to load Bluebird/Serve, however it is always a good idea to do a small test. Gift cards that do not have pins will not work at Walmart to load Bluebird or Serve even if they have the word debit on them. I just tried loading my bluebird at the register with a US Bank Visa, but it was declined with “payment method invalid.” The cashier told me they no longer accept gift cards. Any work around? I want to know the same thing. Been searching online can’t get a set answer. I only tried meta bank. To scared for other but would love an updated response. Went to Wal-Mart yesterday and loaded my SERVE card up using the money kiosk. I used $500 from the Reloadable Mastercard from US Bank that I bought at Kroger. denied at walmart trying to load my serve card with a metabank gc, cashier called the manager over for an override and i was told you can only load with bank debit cards. Tell the mgr your calling bluebird then to verify it. do you always buy new debit gift cards or do you buy new gift cards each time you do it? which is better if it doesnt matter? For this purpose Visa gift cards are debit cards. I think they’re asking about the different options, for this purpose gift cards are debit cards but pre-paid debit cards (from PayPal, Vanilla, GreenDot, Netspend, etc.) are all labeled “Not a Gift Card” on them because they require you to verify personal information. I actually had the same question. I’m thinking that if it’s a legit “Pre-Paid Debit” which I paid for via credit card, and they have my identity, maybe they’ll be less likely to shut it down if I load it onto my Serve or Bluebird? Ofcourse, the downside is they’ll have my identity and they may not let one individual re-purchase numerous cards. I’m new at this and trying to figure out which card to get. Looks like the RedCard is cheaper to refill by using Vanilla which has lower fees vs Visa Cards. Is this correct? If so it might make sense to go that route but the challenge is filling the cards through a cashier vs MoneyCenter and also the difficulty in obtaining a prepaid redcard in Tx. I need to move these Visa Rebate cards to a pin enabled card and then to redcard/bluebird/serve–one of them Any suggestions? vanilla can no longer load. Period? Or just not over $49.99? UPDATE: I can CONFIRM that I was still able to successfully load $49 from the Vanilla card to Serve at the KATE at one of the Wal-Marts near me. Bought vanila visa from walgreens (discover + apple pay) just to test myself at walmart. I know reportedly it should not work above $49 per load. I was ready to test & load $49 at a time. The success rate is quite random. That has been my experience as well. It does work, but not all of the time. I am new to this forum. Thanks for all the info. I saw a couple comments said Vanila works under $49? Does US Bank Visa/Master still work to load $500 BlueBird?? Thanks. Can I still use visa gift cards with a pin that will act as a debit card to load bluebird at Walmart? FWIW Wal-Marts in my area have replaced all gift cards with Vanilla brand. All the Office Depot near me are also exclusively Vanilla. Meta Bank cards are disappearing from local grocery chains as well. I have had no problem loading Meta Bank cards at Wal-Mart when I can find them. question….can you use a simon visa gift card to load funds to bluebird online via the bluebird website? No. It doesn’t. Yesterday itself I bought simon gift card with $500 amount. I registered the Simon GC with my name and set the pin too. Then I tried to link it online via blurbird site. I tried it several times over 2 days. Each time it got declined with message CARD ISSUER DECLINE TRANSACTION CODE. I called up bluebird customer care. The rep explicityly told me it will work with bank issued debit card only with my name on it and not pin enabled debit gift cards. I just tried to load funds of Vanilla to BB. It did not work for the first two attempts but then I was able to have it loaded completely $49 at a time. We do not have KATE where I live so I had to go through Service Center. What might be helpful is when you verify the amount that you are loading, then you need to swipe your Vanilla GC. After you swiped, hit cancel and you will see the choice for debit, credit, etc. I did 9 transactions and every time it worked like a charm. I’ve been unsuccessful in my last 3 attempts to purchase Vanilla Visa giftcards at CVS in the amount of $500. Anyone else having this issue? So what cards do we know work at Walmart for $500 now and where can you buy those? The US Bank mastercards from Kroger how do you know what the pin is for using it as debit? The pin is normally in the packaging. A few of the older cards don’t come with a pin and you have to call 866-952-5653 to set the pin. I purchased US Bank issued VISA gift card from FRY’s food story (part of Kroger chain), there was no pin. So i called in and set the pin. Tried at the Kiosk and at the register, no luck – it was declined, the error usually i get when I try vanilla gift cards. Can you clarify / confirm US Bank issued VISA gift cards work with bluebird? They do and I have confirmed they still work as of a few days ago. With these cards sometimes the pin doesn’t stick correctly. Generally it works if you call and change the pin to something else. It could also be a fluke with the equipment. This really isn’t an uncommon occurrence and everyone I know who has had issues eventually was able to load the card. I just tried to liquidate Vanilla GC for $17.00 and then $15 at Wal-Mart kiosk. I know the PIN is correct but I am getting declined message 55. Anyone help? This is was my first ever attempt to try it, maybe I am doing it wrong. Please advise. I have been successful to load VGC at Walmart with either Kate or cashier with full $500 amount. As I read in some posts, you can load any amount, is it correct. I plan to load load only $400 and save $100 for try out in California. Just tried to load metabank visa to serve like i have done in past at walmart. It accepted the pin and said payment approved but then at the very end the register cancelled the transaction. I went to a different walmart and got same result. Any ideas why? possibly went over the daily or monthly load limit on serve? I live in NYC where there are no walmarts and I don’t have a car to drive to one. Are there options to load the cards besides Walmart? Any updates on this blog? I can’t seem to get any of the US Bank to load at the kiosk. I haven’t heard of anyone else having issues with them. Sometimes there are glitches. Have you tried loading them again? Has there been a US bank policy change? For the past two days at different kiosks and registers at different stores I have tried to load US Bank Mastercard and Visa onto Bluebird and there are all getting declined. I have called US Bank and they said that this card is unable to load and has always been that way. When I explain to them that I have loaded these numerous times in the past they tell me I’m wrong. Anyone else having this issue because I’m now sitting on prepaid Visas and need to pay my bills. Works for me still. I buy the $20 to $500 and buy then in $500 increments and load them the same way. Never had a problem. Any simon mall visa gift cards will work very easily. amit, you can’t use gift cards to load Serve or Bluebird online. They can only be used in-store to do what Amex calls “Cash Reloads”. Don’t believe everything you hear haus. They work. RE: Loading MasterCard GC – I’ve read your linked post on the ‘change payment’ button, but I need clarification, please. My cashier keys in the load amount and then asks me to swipe and confirm. With this method, do I still have an opportunity to ‘change payment,’ or should I give the cashier a specific instruction? Thanks. Looking at MaceRich mall website. Apparently, I can order 10 $500 VG’s, for $4.00 Each, plus $10 Flat Rate Shipping. Came to $5050 (About) for 10. I can even get my name on Them! But the website shows they are affiliated with Gift Card Mall, which is notorious for no pins. Can i use These to buy MO at WM? Will They have Pins? I had the same issue. However, this is the first time I was loading a Mastercard USbank-issed one at a Walmart. I was considering using a Kiosk, but it seems that RiteAid is the only option now to unload this. How would you unload these cards at RiteAid? I have loaded several Visa GC’s that were purchased at Kroger recently with no issues at all via Bluebird kiosk and cashier at Wal-Mart. These include 100 cards and a variable card that had a few hundred on it. All appears to work in South as I did this in two different states. Hope all continues well! I too recently tried to unload a US Bank Visa debit card, which I purchased at Kroger, to my Serve card at a WM MoneyCenter Express kiosk and was denied (code 75). I tried twice on different days and after resetting the card PIN. I’ll give it another shot at another kiosk but if it doesn’t work, I’ll stick to other cards in the future. I’ve had occasional issues with the US Bank cards issued by Kroger being loaded at KATE. A few times it said the PIN was invalid so I tried it again. No issues the second time around. 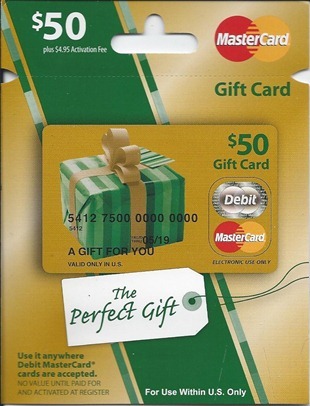 I have been having problems loading $500.00 gift cards at walmart. Started about 2 weeks ago, I loaded one card successfully, the 2nd card got to the approved screen, then transaction was cancelled. Tried at another Walmart different card same story. Tried with my wifes bluebird (different card) same thing. I’ve tried metabank and sunrise cards. Going back to USPS money orders. Same here. I just started trying this out. Bought a total of 4 cards. The last two I’ve tried is giving me problems. It works sometimes and other times it doesn’t. I was able to get 400/1000 to load but now it keeps declining. SunTrust PIN enabled Visa Gift Cards no longer (tried 1/7/16) work to load Amex Serve whereas the exact same cards worked on (12/30/15). This in Bellevue, WA Walmart. Manager apologized and said this was their new policy since the first of the year. Arghhh. Just went to walmart and successfully loaded 2 $500.00 gift cards. Both were metabank cards. I guess the problems I was having was just a one time thing. I have been buying the metabank cards at grocery stores so I can get the bonus points. Shop Rite, Big Y and Stop & Shop to be exact. You can also get $500. cards at Wal Mart that will load to Bluebird. Thanks! I was able to buy and load a $500 suntrust from Walmart. Not sure I’d do it again, since the fee is $5, but I needed $500 to pAy my rent w bluebird. Going forward, I think Simon Mall visas, especially the business version, are the best value. I just want to know how do I get a card? And I saw a lady at Walmart the other day and she held up her phone to have the cashier scan it to pay for her stuff I’m really confused how to redeem the money I’m collecting, please someone help! Just an FYI. I was at my local Lowes today. They have US Bank AND Metabank giftcards over by all the other numerous giftcards they carry. Cool. Guess I’ll have to visit them tomorrow and see if mine has any. just tried loading a $200 Meta card from Office Depot. Put in code and said approved then cashier said declined and handed me a small slip of paper—contact issuer. Work around ?? I purchased a $500 single-use VGC at Kroger for $5.95 and loaded it successfully to Bluebird via the clerk at the Walmart MoneyCenter desk. She told me all register clerks should be able to do it, but that newer ones may not have had the training. I went in the morning when the MoneyCenter had no line. They take the Bluebird card and scan it at their machine, ask how much to put on it, then they had me verify the amount, and then swipe my debit card. The card-swipe machine for the debit card was down low in front of the desk for privacy in swiping and entering the PIN. This felt very smooth. I tried to load Kroger 123 rewards visa card with credit card and it could not load it. Card says only cash payment required What was the exact card you purchased from Kroger using Credit Card? bought a VGC on staples.com (giftcardmall/metabank). “4 digit activation code” is required. where can i find this code? This might not be the activity for you. That information is readily available in many places. I loaded four $500 Kroger Visa debit gift cards into my bluebird account end of Nov. (And multiple in Oct). I have gone to 3 walmarts this week and tried to load my 5th card and it won’t upload. It is a debit gift card with a pin just like all the ones I’ve done the past few months. I checked my Bluebird account. It is still open. Hi Bonnie- Maybe the monthly limits have changed? I don’t see anywhere online that they have though so not sure. I’m thinking of doing this soon- what did the Kroger debit cards look like? Were they just prepaid visas you bought at Kroger? The Bluebird monthly limit for debit card deposits is $1000. You may just have to wait until next month to try again. Newb to the game here. Bought 2 x $500 OneVanilla Prepaid Non-reloadable Mastercard Debit Cards at Sam’s under the AMEX $250 back on $1,250 promo. Just got my AMEX ONE VIP Serve card in the mail and and trying to figure out if I can load these debit cards onto the serve card or not. At the Walmart kiosk you need a PIN. These cards get a PIN at the POS after the first use. (User picks). If I buy something using the card(s) and set a PIN, can I then load the value onto the Serve card, or do these cards just inherently not work to load to Serve? Anyone been in this situation before? I’ve only used $500 Metabank gift cards that i buy at safeway. For these you just use the last four digits as the pin and i have no trouble loading them at the register to my Serve One VIP, just did it today. That’s the only method i can speak for, I live in Hawaii so not sure about walmarts in other states. Is there any gift cards that can be purchased to add money to a bluebird card online? My son is in another state, and has a bluebird card. I do not have a bank account to send it through. I’m just trying to send him some for now. Hello. I went to a Walmart today to load some visa gift cards onto a serve card and was told that Walmart doesn’t allow that anymore. So I went across town to another Walmart and had no issues loading the gift cards onto my Serve card. Does anyone know if Walmart changed their policy at all to stop taking visa gift cards to load serve cards? I’m just preparing to see if there is any kind of transition happening with how Walmart does loading. Or is it possible the sales person I dealt with was confused on the actual policy that Walmart has? Can certain stores change their policy to whatever they want? Thank you in advance. Many cashiers will tell you that you can’t use a gift card to load Serve if you explicitly ask to pay with a gift card. There was never an official policy saying that they accept visa gift cards — the fact is that the cards noted in this post run as debit cards on the payment terminal, so they just work at the payment terminal. Generally, I just say I’d like to load $X. When it comes time to pay, I just swipe my card and enter the PIN. I wouldn’t make much of an argument out of it if a cashier told me I couldn’t do it as I know it’ll likely work fine the next time with a different cashier. No sense in arguing about it with the one cashier now and then who protests since I know that I likely won’t have a problem next time with a different cashier. I continue to load to my Bluebird AMEX at wal-mart with no problems using the solutions Nick mentioned below. I only buy VISA’s issued by METABANK and US Bank. Do these gift cards still work at money center kiosks normally? Does any one know if Walmart changed the setting in their terminals. last few days we were able to load gift cards only at some walmart and that too on 1-2 terminals. Now we cannot load anywhere as it is rejected with “Debit not approved call authorizer”.